Many kids are homeless in Africa and South America, suffering with poverty, malnutrition, aids and many other ailments. dedicated to supporting the following orphanages. Africa is very close to our hearts as we were both born in this amazing continent. Stephen was born in Uganda, but left as a young child and I was born in Zambia, but spent my growing up years in Zimbabwe, leaving at 20 to drive from Zimbabwe across 16 amazing African countries to Switzerland. Restore a Child introduces Warren McDaniels and his wife Jodi, the new administrators of Familia Feliz in Bolivia, succeeding Melissa Harding, who founded the orphan home in 2005. “We are originally from the USA and have been missionaries for the past 12 years in Guyana, South America. In Guyana, we started and managed two high schools in the interior. Thank you for the financial support your organization has provided to our orphanage over the past [six] years. I [am] delighted to … assure your donors that their funds are being applied to help the children of Bolivia. The McDaniels noticed that the condition of the land at Familia Feliz during and after rainy season is not conducive to growing fruit or vegetables due to poor drainage. They have begun building 10 greenhouses, necessary to ensure year-round vegetable crop production to feed the children at the orphanage. The cost to construct one greenhouse is only $380. Your generous donations will help this project become sustainable. Original story about Familia Feliz below. started in 2005 by a single, 22-year old girl with a burden to reach the homeless children of Bolivia. She travelled to Bolivia with the intent of spending a year or two learning the language, culture, regulations, etc., and then returning later, after raising funds, to begin her work. then to care for a family of four children whose mother was dying of cancer. She rented a 3-bedroom house and moved in with this extended family. The mother was expected to live for another year, but exactly one week later she died leaving Melissa with the total care of 5 children. She had very little Spanish and no financial backing but she saw in this the hand of God urging her forward. Her Grandfather's brother sent her $5,000 to help her. 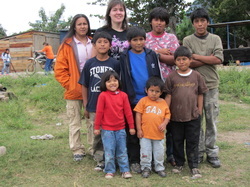 In less than a year, she had more than thirty children and two other volunteers living with her in the 3-bedroom house. Along with the issues of overcrowding and ongoing financial needs, she also faced the problems of attempting to train and educate the children in a town environment with classes held on Sabbaths. After much prayer, she found the piece of property on which a school/orphanage could be built. It is 10 miles from the town and has more than enough room for children to run, play, learn and grow. A decision was made to move ahead in faith and begin building and the result today is 8 homes for children and their house parents. In addition, there is a large building that serves as classrooms and offices.Over the last five years, the number of children has fluctuated between 35 and 50 students. At the beginning of last year, we received over 150 applications. What to do? We accepted 85 students and are literally bursting at the seams! As Christ saw in men what they could become, so we see in every child a little one who Jesus would have taken on his knee and blessed... "For of such is the kingdom of heaven.^"